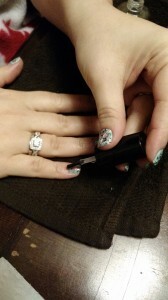 Granite/Saranwrap nails have the luxury of looking like they take a long time but not taking much time at all to complete, with little clean-up involved. You only need a few colours to achieve this look and no tools. 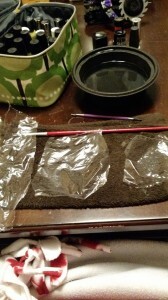 I looked up some YouTube tutorials on how to Saranwarp nails and found them helpful before I started. 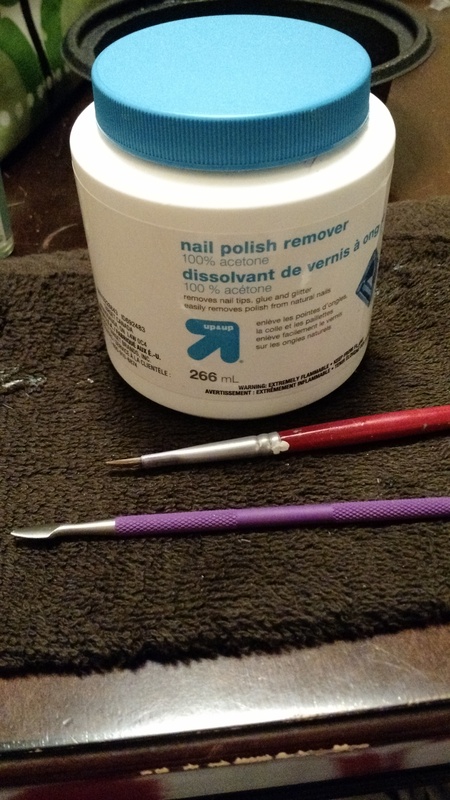 I used 4 nail polish colours for these nails, a base coat and a top coat, saran wrap, a brush for cleanup and pure acetone. 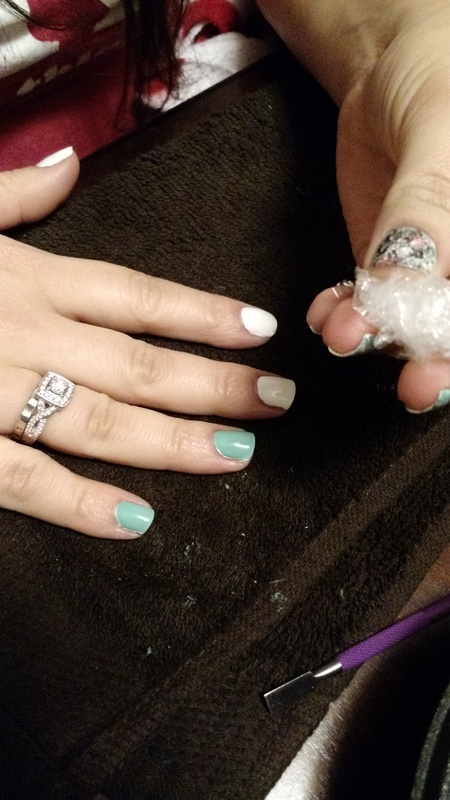 I used Seche Clear and Seche Vite, Sally Hansen Insta-Dri’s OMGhost, NYC’s Mint’ed on Broadway, Revlon’s Knockout and Essie’s Tart Deco. 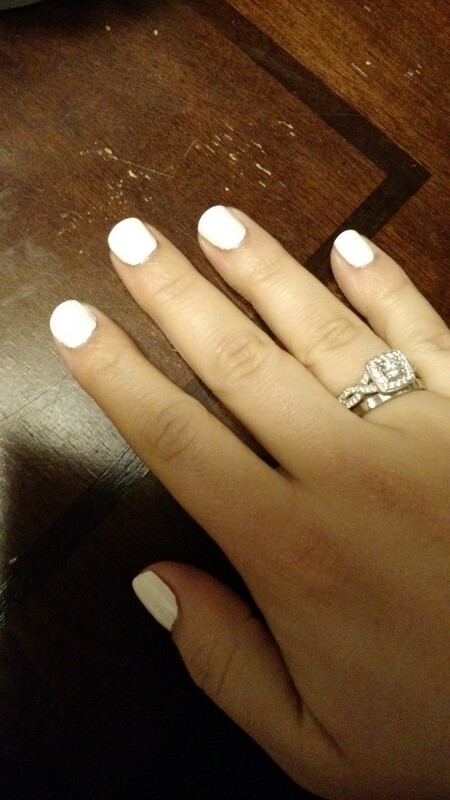 First I painted a coat of Seche Clear and let that dry. Afterwards I painted one coat of OMGhost. I don’t love OMGhost but when I’m only using white as a “base” it works fine and I don’t feel bad when it doesn’t go on perfect. 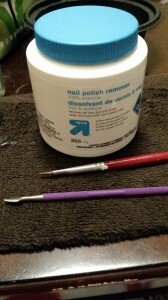 I always clean up with acetone and a brush after each coat so there isn’t a huge build up at the end to deal with. I let the white dry and then painted on a thick-ish coat of Mint’ed. I let it sit for maybe 20 seconds before taking a balled up piece of Saranwrap and pressing it very gently down on the nail. 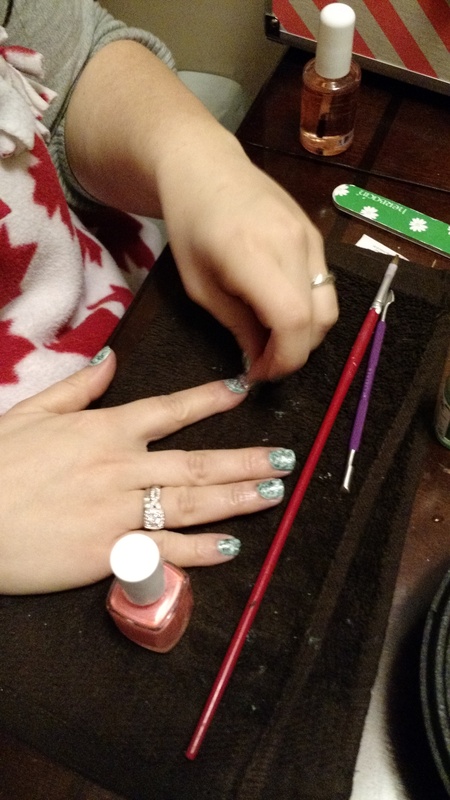 I repeated this a few times on each nail until it looked spotted/speckled but not so many times that the turquoise was too thinned out. I did the nails two at a time so that I could control how much they dried before I “sponged” them off. 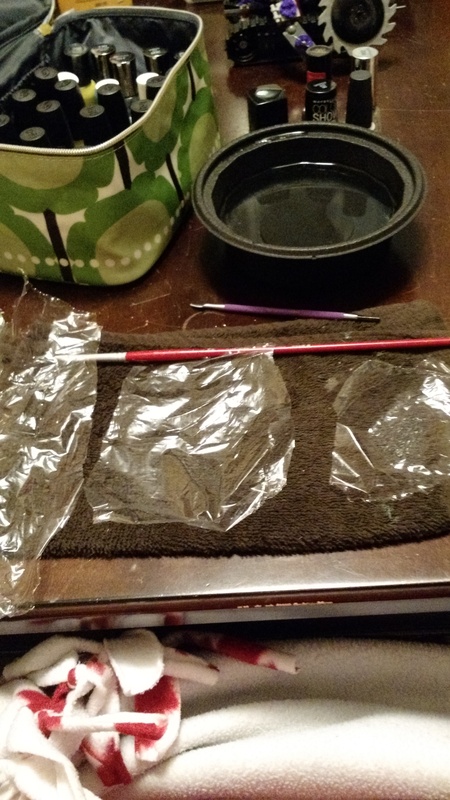 Then I did a quick clean-up again with the pure acetone. 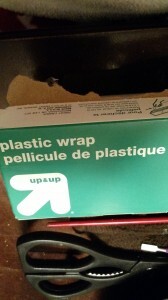 I let that dry for a little while, maybe 2 minutes or so, it didn’t take long, and then took my second piece of plastic wrap and painted Knockout onto it while I held the plastic wrap. 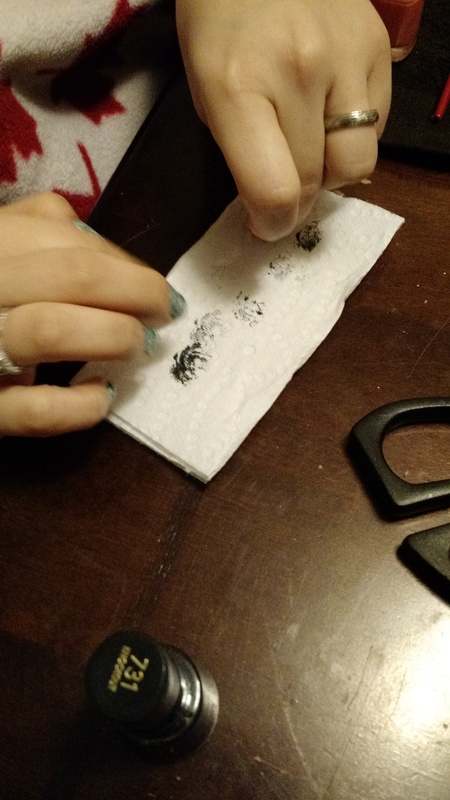 *Don’t paint the black right onto your nail*, you want to build up what you did with the white/blue by sponging on black as opposed to taking black off. I found it worked best if I painted a small section of the plastic wrap, dabbed it very gently on a paper towel, and then dabbed it onto my nail. I did them 2 at a time again. I let this layer dry for maybe 30 seconds. Then cleaned up with acetone. 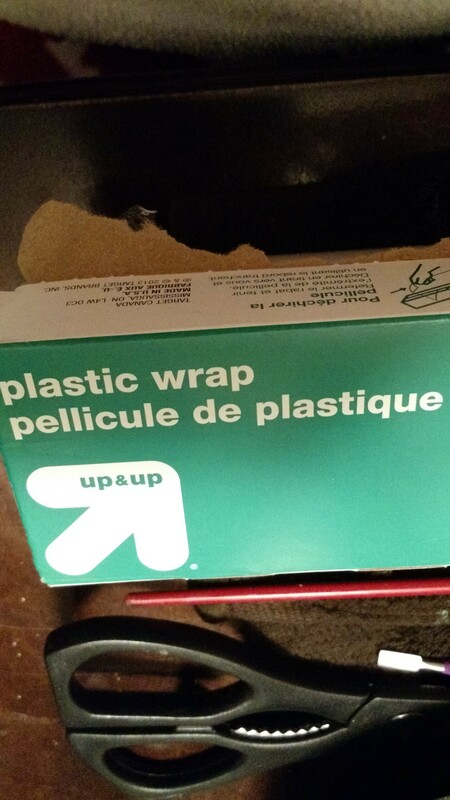 I repeated the exact same process with Tart Deco and a different piece of plastic wrap. 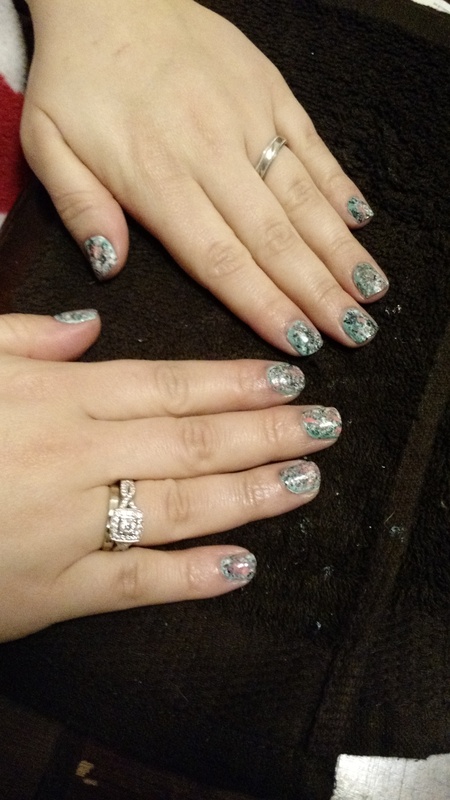 I tried to alternate how heavy I touched my nails each time I brought the wrap down so that there would be different patterns/texture on each finger. 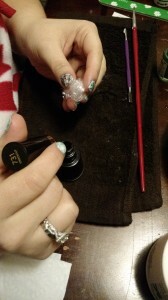 I cleaned up with acetone one more time after this step. I let this dry for about 30 seconds or so. 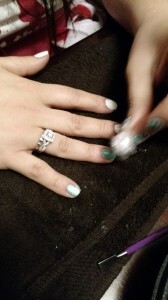 I top coated with Seche Vite. 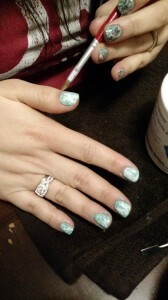 Here are the finished nails. They didn’t take very long and they weren’t complicated to do. I even did this tutorial on my dominant hand, which proves the relative ease! I like this nail style because you can use any 3-4 matching colours and no tools and you have a pretty cool look. Each time you do it you can use different colours and it’ll never look the same twice and if you use the right colours they can definitely look like granite! I’ve always liked painting my nails but was pretty terrible at it, if I’m honest. I was the type of nail painter who put one a coat or two not-too-poorly on my non-dominant hand and pretty-not-great on my dominant one. 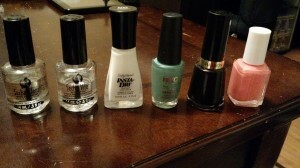 So while I had maybe 4 nail polishes in my arsenal I didn’t use them very much. A few months ago I was browsing on Instagram when I came across this picture. Matte black nails. I think my mind blew up a bit. 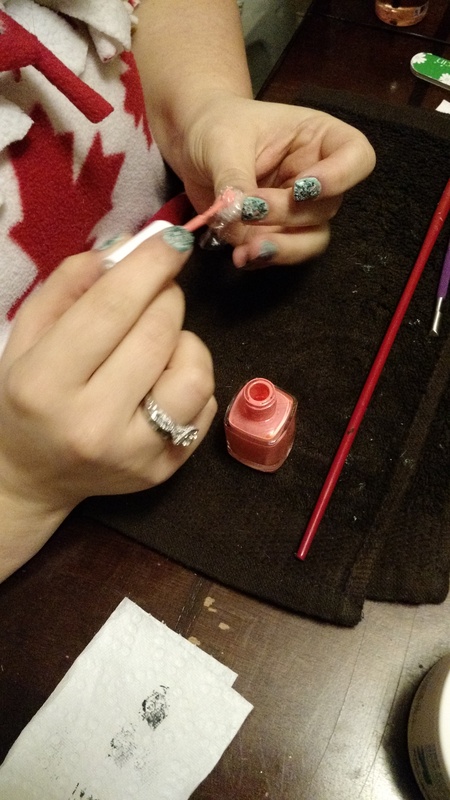 I had been out of the nail polish game a long time, it seemed, and while I was away everything got way, way more intricate and more fun. I needed to find out how to do matte nails. And that was my jumping off point to the world of nail art. 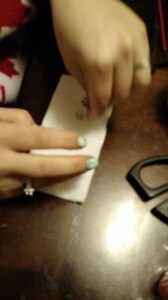 Since then I’ve re-dedicated myself to painting my nails. In November and December I tried a few things, ordered a few things on Ebay, and bought some more nail polish (at this point I really only did have the 4 previously mentioned), and focused on painting my dominant hand properly. 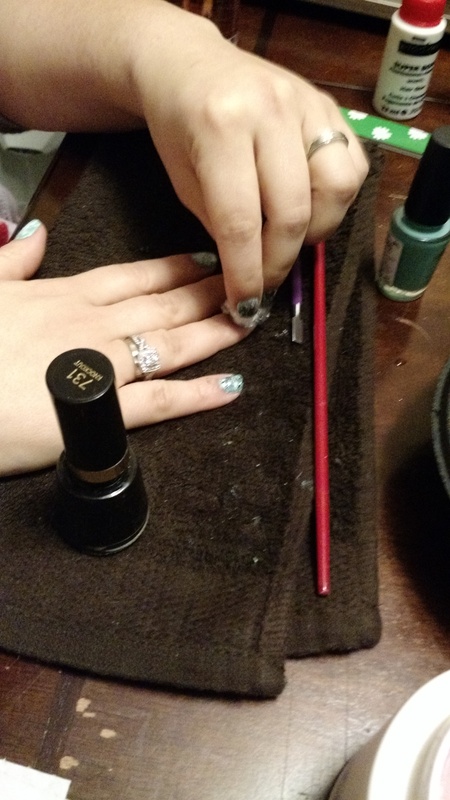 In January and February I started getting fancier, trying new techniques, and buying maybe too much nail polish. I watched swatching reviews, tutorials, followed loads of amazing nail artists on Instagram and started taking pictures of each time I painted my nails. I’m having a blast. 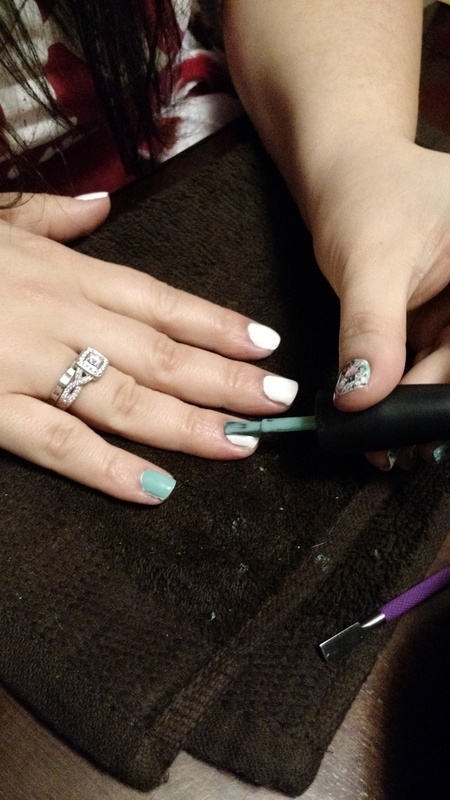 So much so that blogging was the next step for me in my nail journey. 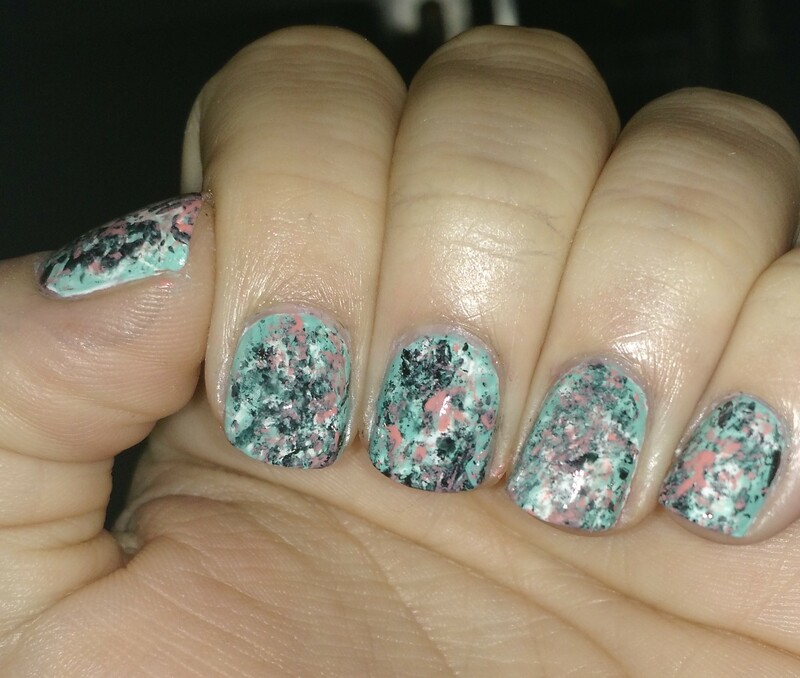 So, here it is, my first nail post! I look forward to documenting my procedures so I can see how I progress in the future and I hope that in my nail blogs you find something helpful!